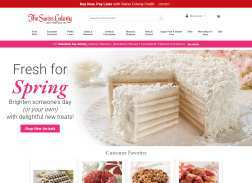 The Swiss Colony is a mail-order and online retail company that sells food products. It also sells furniture, home decor, entertainment, apparel and electronics. The Swiss Colony has a 60 day return policy and the customer service is known for its friendliness. Get a Free Best-Seller Assortment Tin with Your First Purchase. Limit one free offer per year per customer. A $21.99 value. Not valid with any other offer. Get up to 75% Off Sale. Get Free Swiss Colony Catalog, no purchase required.